After a quick two hour flight from Singapore to Ho Chi Minh City, we were on a 5 hour layover heading to Nha Trang, Vietnam. Since we had some time to kill in HCMC, we though it would be a wonderful opportunity to venture into this former city of Saigon. We exchanged our money into Dong (VND) at the airport, hopped into a cab and requested the taxi driver take us to city center. After driving through the busy streets for approximately 20 minutes, we ended up near a Louis Vuitton store, a beautiful Opera House, and a few large hotels. The four of us thought the area looked like a great place to jump out of the cab. We noticed lovely outdoor seating across the street at Highlands Coffee (like a Vietnamese Starbucks). Then proceeded to weave through the wall of speeding motorbikes to sample Vietnamese iced-coffee in Vietnam! We sat down at a table with comfy black wicker chairs and perused the menu. Slightly different from a Starbucks in that this Highlands Coffee was also a restaurant offering hot and cold Western and Vietnamese dishes. Considering Vietnam is one of the least expensive places to eat in the world, the prices were relatively expensive. 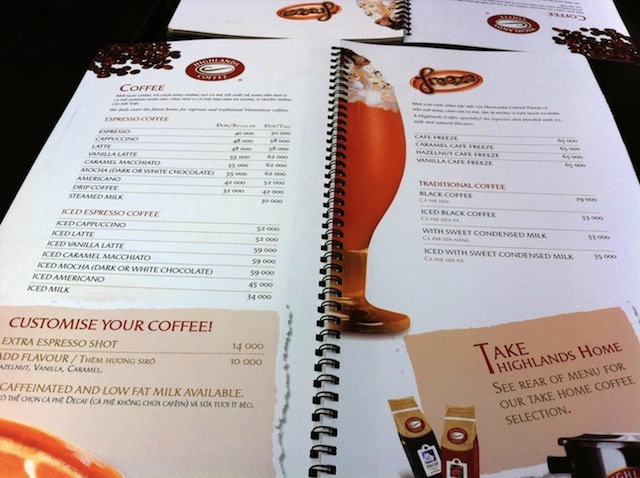 ‘Traditional’ iced-coffee with sweet condensed milk was 35,000 VND (approximately $1.60 USD). 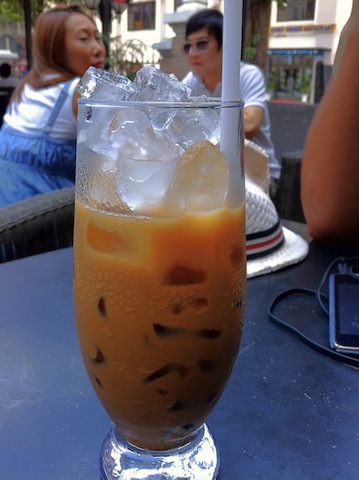 Our iced-coffee (or ‘crack’ as we so fondly called it) experience continued to flourish hereafter. Luckily for us, we discovered that Highlands Coffee offered free wifi. Gary loaded SKYPE on his trusty iPhone 4 and saw that our friend SiHeng (from Victoria, BC who lives in HCMC) was online and rang him up. He explained that we were in HCMC at HC and that we had a longer layover than initially anticipated. SiHeng warned us not to order anything and that he and his fiancée Jen (sitesnbites.com) would come take us to eat some authentic Vietnamese food! We already had our iced-coffees in-hand but did cancel our food orders 🙂 Click here to read about where Jen & SiHeng took us for yummy eats.